Matched betting allows you to profit from the hundreds of free bets and promotions offered by bookmakers. This isn’t illegal or under the table. Al the bookies advertise these offers to entice new customers in. This is when you bet for a certain something to happen. So like “I bet Manchester United will win.” If this comes true, then you win the bet you placed and the winnings. If they lose or draw, you lose your money. You can place a back bet with any bookmaker, like Paddy Power or William Hill. This is when you bet against something coming true. “I bet Manchester United will not win” is an example of a lay bet. If they do lose or draw, then you win. You can only place a lay bet at a betting exchange, like Betfair. Matched betting works because it cancels out the risk of your back bet by betting against yourself at the exact same odds. You are matching your bet. You now repeat the process and whichever way the event goes you win. For each bet you match, you’ll be left with up to 94% of the free bet profit after the betting exchange take their commission, normally 5-6%. You may loose a few pounds on your first bet. This is all recouped when you use your free bet. What’s the risk and why isn’t everyone doing it? Everyone could matched bet, but it does take time when you start. There really is no risk, as you are covering yourself by betting for and against the same scenario. The only risk is if you get it wrong. Everything needs to be doubled checked. Free bets do get deposited, but sometimes take time, so don’t panic. Gambling websites do NOT affect your credit rating but if you’re using your winnings to put a deposit on a house for example, then you may need to declare it. These aren’t a must have but do make life easier and quicker when it comes to matched betting. Profit Accumulator offers you free use in till you make £45. This gives you enough time to work out if matched betting is really for you. Odds Monkey is another one that offers a free trial. They both list all the offers known in the UK and help you to odds match, meaning you spend less time working out what to bet on and more time making money. Matched Betting spreadsheet: This will help you track what’ve bet on, what you’ve won and the odds. You can download our Free printable spreadsheet one here or make your own. In this guide, you will learn how to easily make £20. If you do this using the hundreds of free bet offers, then you can easily make thousands of tax free cash! Make a new email address so you don’t get spammed, but also so you can see all the offers clearly in your inbox. Sign up to Betfair. They’re a betting exchange, so this means you can lay your bet and cancel out any risk. Betfair is the only place where you can bet against other people, so this needs to be done first. Remember to check your inbox, as they sometimes send offers to new customers. There’s loads of offers around. Start with a small one, like someone offering £20 free bets when you bet £5. Once you’ve signed up, you’ll be asked to deposit £5 to qualify for the free bet. Once logged in to your bookie of choice, change the odds to decimals, as this helps you compare them to Betfair. It’s vital that you do this! It’s easier to start with a sporting bet, like football or horse racing which has the closest odds on both bookies sites. Lay odds can on Betfair are the red boxed, not the blue. If you’re struggling to see the red box, then go to the top left and click exchange. Some offers will have terms that state you must pick odds of greater than something. It’s better to choose your bet with low odds when you start, so something like 1.4 to 4.1 if you can. At this step its best to use a odds matcher tool like Profit Accumulator, who match the odds for you. EXAMPLE: So if you’re using Coral, you would bet Manchester United to win there with odds of whatever they are, lets say 1.80 for this, and lay the same bet on Betfair with their odds. For this example our oddsmatcher, Profit Accumulator, says we would lose 11p on this qualifying bet. You would then deposit your £5 which means you can unlock the £20 free bet. Go to Betfair and deposit £5 into your account. Again, on Coral, place your £5 bet on Man United to win at odds 1.80. This then brings up your betting slip. On Betfair, find the same match, and click on the lay odds of 1.80. This is the red button. Type in £5.14 under “Backer’s Stake.” This is your lay stake on Man United to win. So whichever way the game went, I would be down 11p but up by my £20 free bet. Whatever the outcome, because you have matched your bet, you will have close to your initial deposit back but in both accounts. Then your Coral account for example would be credited with your free bet. Place a new bet at higher odds. Now you go back and use the free £20 bet instead of the £5 one. You may have to use the £20 in 4 separate bets, but that’s fine, just place them on the same event as separate bets. Place a bet using greater odds to help increase your profit. Remember: the bigger the odds, the more you’ll need in your Betfair account to lay. EXAMPLE: Leicester vs Tottenham with back odds of 5.o and lay odds of 5.20. Go to Coral and place your £20 free bet on Leicester to win at odds 5.00. Make sure you click on your free bets. On Betfair, find the same match. Lay the odds 5.20, the red button, and type £15.53 under “backer’s Stake.” This is your lay stake on Leicester to win. On this free bet you’ll make a profit of £14.77 regardless of what happens. Now it’s time to cash out. That’s an hourly rate of £29.32. Not bad. There’s always loads of offers around including reloads. For these you’ll need more money in your pot, maybe around £1000. Emma Drew’s post here explains them really well. 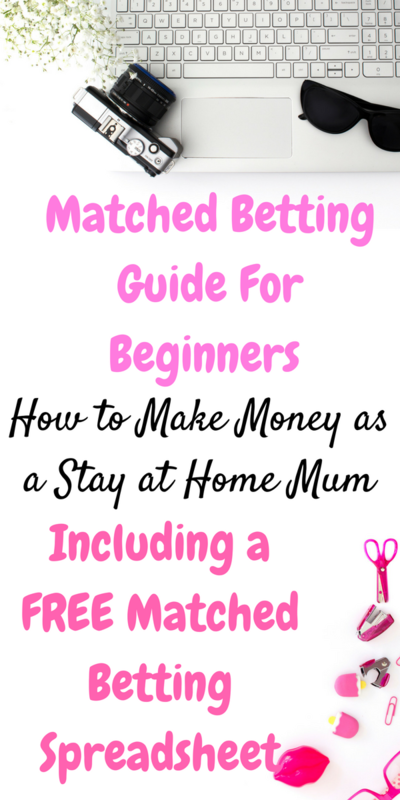 If you can give 1-2 hours a week to matched betting and use this guide, you can easily make anything from £500 upwards a month. Have a target and try to beat yourself. 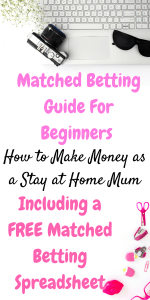 Receive your FREE matched betting guide PLUS 16+ FREE money saving printables you can download straight away. Have you tried matched betting before? Do you like it? Do you think it’s worth while? 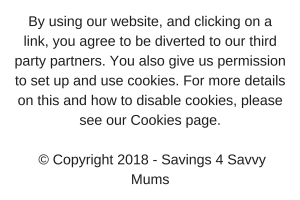 I hope you found this post useful, please pin it for later if you did! 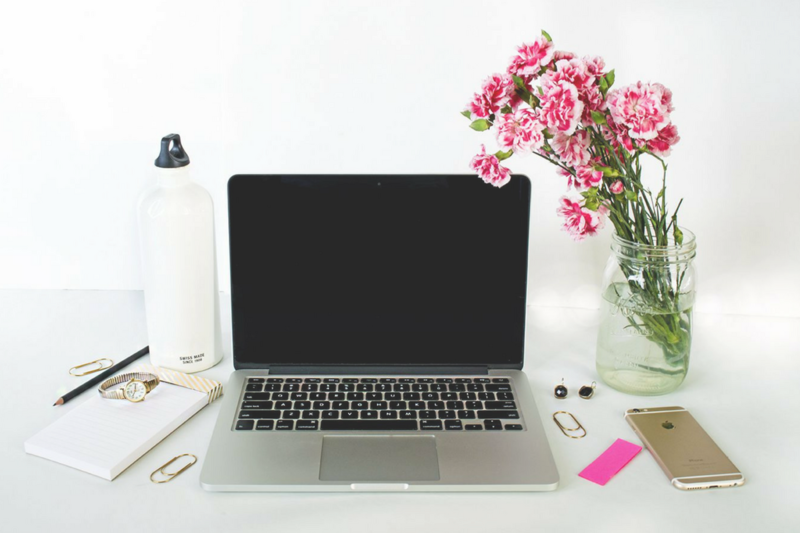 For more posts about making money as a mum, check out the Making Money section or follow my Money Making for Mums board for more ideas on how you can make money from home.